The present honourable prime minister of India, Sri Jawaharlal Nehru has suggested ‘peaceful co-existence’ as an antidote to the principal problems faced by today’s extroverted state of world affairs. Everyone accepts that due to the overzealousness of warmongering nations there is a chance of complete annihilation of world peace. If the policy of ‘peaceful co-existence’ is followed to the point, then there will be no necessity of spending millions to finance defense machinery, armies nor will there be a need to invest millions in maintaining the department of defence to protect the country. Instead, if that money is utilized in developing other activities for the country then the nation will become prosperous and the ordinary citizens of the country will be able to live in peace. If the above policy attains more prominence then the necessity of a police force, which is kept for the welfare of the common people, will also reduce – this is a fact. Although it may seem impossible to the human intellect at present, it is a clue to peace and Indian politics. Now it needs to be seen what is the origin of the aforementioned policy? It is easily discernable to an impartial acute observer – its origin lies in a belief in the world within us, on other words, a belief in the Supreme. If the jiva is not guided by his belief in the inner world, or knowledge of dharma, he cannot follow the path of peaceful co-existence. This means that there is no possibility of peace in the negative world until the jiva enters into connection with the positive world. When one is in connection with the positive world then one realizes the insignificance of ‘small and great,’ ‘profit and loss,’ ‘happiness and distress,’ and ‘victory and defeat’ found within this negative world. When one studies the history of spirituality, one finds that the mahatmas, who were expert in spiritual topics, instead of focusing on making permanent arrangements to stay in this mortal or external world, utilized their entire endeavor in obtaining ‘membership’ in the internal or eternal world. In such efforts they also achieved success. They only accepted whatever elements or products that were easily obtainable in this world for maintaining their lives. One has to bid goodbye today or some days later to this plane. If one makes permanent arrangement to stay in this temporary ‘hotel-like’ world, he will attain no permanent gain except for increasing the intensity of one’s misery. There are famous mahatmas in history who, in spite of obtaining a very long life spanning many yugas, considered it very negligible compared to eternity. Considering things in this way, they set an example by residing under a tree, absorbed in meditating on the eternal spiritual world. Even some mahatmas considered it a waste of time to collect clothes for the body and remained naked. This is the country of that great culture. Therefore it needs to be seen what are our problems and what are their respective solutions. Needless to say that the policy of ‘peaceful existence’ is only momentarily successful in alleviating the raging problems the world is facing, it is not a permanent solution. This is because the element that creates or forms our problems is the one that possess the inclination to acquire jnana and perform activity – namely the consciousness. In reality, the necessity of food and clothing are not the prime problems. Countries that have sufficient food and clothing and immense wealth also cannot avoid problems. They do not have less problems and suffering. Presently America is the most prosperous country. But if we analyse America a little closer, you will find that those who are famous as the wealthiest amongst them, that are immersed in all sorts of worldly enjoyment, have the highest record of suicide amongst all the countries of the world. Therefore it needs to be seen where the fault lies. It makes no sense for a person who is completely bereft of food to hope for food, or for one who is ultimately bereft of peace to hope for peace. Similarly, expecting solutions to problems from living entities who are always bogged down by problems is also futile. But the solutions to all problems have been given by the all-knowing Bhagavan Veda-Vyasa through the medium of the sun-like purana the Srimad Bhagavata and the Srimad Bhagavad-gita which occupy the highest positions in saintly conclusions. 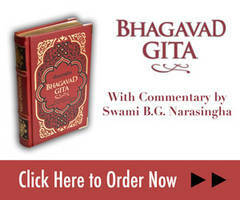 Srimad Bhagavad-gita and Srimad Bhagavata have manifested to provide solutions to the most serious problems ever faced. From the words of Mahatma Bhisma we come to know that the great warrior Arjuna had the power to defeat a whole army of eighteen aksauhinis (horse battalions) in a moment – yet in spite of his being so immensely powerful and being capable of creating such massive destruction, he was perplexed in solving the problems that he faced. At that time Srimad Bhagavad-gita appeared. On the other hand, when we see the position of one who was worshipped as the undisputed sovereign controlling the destiny of all his subjects – when he understood that he had been given seven days notice that he would depart from this world then one can imagine the grave problem confronting him. You will see that his problem far surpasses all other problems commonly faced by us. At that time, that which manifest to give him proper guidance was the Srimad Bhagavata – that which eradicates sorrow, illusion and fear (soka-moha-bhayapaha). Srimad Bhagavata or Bhagavad-gita have not cultured any sectarian concept. In a universal manner they have given us solutions. Even if we are enamored by all kinds of problems, they have given us the thing that can give us real peace. For this reason these two suns are shining brightly in all countries for all times in their full splendor. Take the case of Srimad Bhagavata – when Pariksit Maharaja was deeply concerned about the dilemma he was in after hearing various opinions from great men and sages, at that moment, by divine providence, Sukadeva arrived. The enquiry of Pariksit is not that of any particular group or class of people – it is not even confined to the human species – it is relevant to all conscious jivas. At that final moment he only had one question – what activity within this very short phase of time can lead to attaining supreme auspiciousness and transcendental peace? In what way is it possible to obtain the greatest benefit? Pariksit was affected by this problem – the giver of the solution was Sukadeva. One is in an extreme crisis and the other is the solution-giver at that extremely critical situation. On this point there are similar comparative narrations in the Srimad Bhagavata which you can understand in more detail. Hearing Pariksit’s question Sri Sukadeva, who is self-satisfied and worshipped even by the denizens of Brahmaloka, became satisfied and replied, “O King, this question of yours is not only relevant to you – this question is relevant to the entire world and it a most pertinent one. The only program of the atmavit is to be delivered from the clutches of ignorance. A person who has submerged under water – his only program will be to try to save himself. Despite all kinds of external endeavors that are made to improve this world – all such attempts still remain confined to the realm of mortality. Entrapped in illusion and suffering miserably, those who are anatmavit do not achieve any result other than running from one body to another. Their consciousness is fully covered by ignorance and by identifying themselves with the material body, they revolve eternally, subjugated by birth and death. No immediate relief can be obtained in spite of increasing one’s wealth, followers or equipping oneself with more weapons. House and home, wealth, close relatives and dear friends – none of these things are mine. Even my body does not belong to me. Identifying ones body as ‘I’ or ‘mine’– this is an animalistic mentality. While I continue to think of these things as ‘I’ or ‘mine’ I will surely continue to face problems. Birth, death, old age, disease – yet at that time I will surely be tricked into transmigrating from one body to another. Thus, in this way, for all eternity, one will never be able to discover the path that will deliver one from these problems. The Bhagavata has said, “You have not even learnt how to look at these problems properly. The way to look at these problems is svapne yatha siras-chedam (like the cutting off of one’s head in a dream). The man who is sleeping, shouts in his dream, “I have been caught by a tiger!” He only needs to be woken up to solve the problem that he is facing. If he is woken up he will see that everything is fine. He will see that the hope of relief that keeps him absorbed day and night in innumerable programmes – those are actually no ones problem. Sukadeva has said, tvam tu rajan marisyeti pasu-buddhih – this means that death is ‘animal conception.’ You can’t die! You won’t die! So many types of problems are not yours. Back to God –become situated in the self! Reject any material form! You are a member of the spiritual sky. That which you are thinking is nectar –that is actually poison. What you are thinking is happiness, is sorrow; those things that you consider to be ‘mine’ and ‘yours’ are nothing. It is all ignorance. All philosophers that are searching for the self, both in the eastern and western world, say the same thing. All of them say – ‘instead of chasing the hawk outside, first try to touch your own ears.’(1) In the Vedas and other scriptures, various reformatory measures are mentioned for ignorant jivas that are mentally deranged to guide them to become truly ‘self-centred.’ When the uncultured jivas are disciplined through all these injunctions that will raise them to the plane of the atma, then they will be able to realise their true identity. All endeavours progress from ‘shadow’ to ‘substance,’ from ‘phenomena’ to ‘reality.’ It is a one-way journey and this is considered to be real bhuta-suddhi (purification of the self). Once bhuta-suddhi happens then everything is solved. Although with pure knowledge one can overlook or ignore one’s connection to this world, again one faces a problem regarding that other (spiritual) world which we try to conceive of from here. Therefore I will speak a little on this topic and conclude my speech. We find various acaryas teaching various ways of how to undergo the journey from the mundane to the spiritual. From our perspective, a constellation of stars may look as if they are all on a single plane in spite of actually being many light years away from each other – similarly there are vast differences amongst the spiritual contributions of various acaryas. And if we understand them properly then we will fully realize the unique contribution of Sri Caitanyadeva. I have found the solutions to all these topics very beautifully from the Ramananda-samvada portion of Sri Caitanya-caritamrta. Under proper guidance if you read the eighth chapter of the Caritamrta you will be able to clearly understand all these things. We can briefly find a summary of the most vital essence of the ambrosial teachings of Sri Caitanya in the Ramananda-samvada. Mahaprabhu, during His ‘human-like’ pastimes asked, pada sloka-sadhyera-nirnaya – “With the help of evidence from proper authorities, explain the goal for which the jivas should engage all their endeavors.” This question regarding the ultimate goal arises in the heart of the jiva due to good fortune accumulated over several lifetimes. In the first sutra of the Vedanta philosophy, athato brahma-jijnasa, the acaryas have presented that conclusion in an elaborate and clear way. Here Mahaprabhu desires to listen to the answers to these questions in a straightforward manner from Rama Raya. Why? It is not a question of merely repeating something, but to prove it through sastrika reasoning with the help of authorized evidence. In the process of answering Mahaprabhu’s questions, Ramananda, continued to raise various important theories and in this way he gradually concluded by arriving at the highest stage of achievement. Then Mahaprabhu said, eha haya – meaning that, “Now the real path is being taken.” Jnana-sunya-bhakti (devotion free of knowledge) is the starting point of true devotion. Even in The Bible we see that the fruit of the Tree of Knowledge is the cause of fall down. “I want to understand everything!” – this tendency must be rejected. This is because the very intelligence to estimate is faulty by nature. What to speak of knowing Him with our tiny brains, we cannot even fully measure a small atomic particle! For this reason the Bhagavata has given the following point, jnane prayasam udapasya namanta eva jivanti – your capability to grasp reality is very insignificant and limited. There are personalities who know about your real benefit innumerable times more than yourself! You simply need to hatefully reject (udapasya) your desire to be ‘all knowing’ and embrace the path of namanta eva jivanti (dedicating your life serving the Lord). You will see – just like being in an elevator or a lift, you will be raised to a position in Vaikuntha. Whatever was binding you will become your obedient follower. And moreover, san-mukharitam bhavadiya vartam – once you learn to give a submissive hearing to this, you will see that your journey through eighty-four million species will be terminated. And where should you apply your hearing? You should hear from the one who can properly guide you. There should be ‘guidance proper.’ Only this will save you. Whatever condition you are situated in (sthane sthitah), from there itself you attend. You will see that everything will become clear. This is because only the words of the Bhagavata emanating from the lips of a sadhu can save us. For the one who follows this, in spite of the Supreme Lord being impenetrable, difficult to attain, and of an unconquerable nature, ultimately he can conquer Him. Throughout the Bhagavata there are phrases such as, bhaktyaham ekaya-grahyam (“I am attained only by devotion”). Under the shelter of sadhu-sanga and jnana-sunya-bhakti, even ordinary people can attain service to the Supreme Lord, whereas without it, even an intellectual giant cannot. For this reason Baladeva Vidyabhusana, in his commentary to the Vedanta, has proven the importance of sadhu-sanga by citing various evidences. The sadhu is the ‘living source.’ Even if one has no good quality, due to the influence of association of a sadhu one becomes sarvair-gunais tatra samasate (“all good qualities reside with him”). 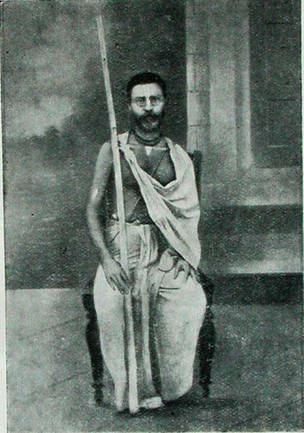 Due to the influence of sadhu-sanga even a very abominable person can become an instrument of service to the Bhagavata. Seeing with an attitude of worship or service is vaikuntha-darsana. Many, like Miss. Mayo (2) in spite of having preached about the filthiness of such worship, have actually never experienced even a slight trace of true worship. They will be thousands and thousands of miles away from the proper understanding of worship. One who is able to approach it with a true mood of worship has nothing to fear. Fear itself runs away upon seeing such a person. One who takes shelter of such a worshipful attitude completely destroys all filthy sentiments and misconceptions – that very auspicious intelligence is the only way to be delivered from the bewildered consciousness that we are in. Saying this, he established the transcendental platform of his dialogue. Therefore those who see Krsna or His pastimes with mundane intelligence, are not only deceived, but they also commit a great offence, and as a result they never obtain darsana of Sri Caitanya and their own identity remains concealed from them. The Lord becomes just like his play-doll. And that itself is the highest manifestation of the supremacy of the all-powerful independent Bhagavan (sarva-tantra sva-tantra bhagavan). For this reason Kaviraja Gosvami has said, krsnera yateka khela sarvottama nara-lila (‘The most attractive play of Krsna is His human-like pastimes’ – Cc.Madhya 21.101). This is the ‘fullest adjustment’ of the Lord’s form – sarvottama nara-lila – where His devotees, who have taken shelter of Him see His ‘all-accommodating’ form as atulam syamasundaram (the incomparable Syamasundara) and completely serve Him eternally in five rasas. This is the very zenith of achievement. (1) This refers to a Bengali proverb which advises a foolish man to first touch his ears to be sure that they are still there before running after a hawk, whom he thinks has stolen his ears.